Upgrade your network with a CAT6 Snagless Networking Cable from Belkin and enjoy clean, clear transmissions. 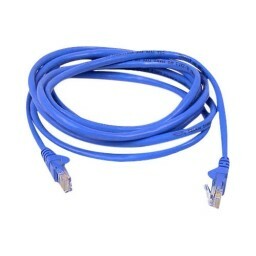 Now you can replace CAT5 cables that don't support 100Base-T or gigabit Ethernet and improve the return loss in your current network by 40 percent. Engineered with 50-micron, gold-plated connectors to ensure clear transmissions and snagless molds to protect the RJ45 tab from damage during installation, this cable meets the performance requirements of Category 6.Belkin Build-To-Order Service: Belkin can manufacture virtually any cable type, length, or color. Contact your Belkin team today to get pricing and lead times. bedirect is not responsible of reviews content even if we do have a moderation process to ensure that rating truly reflect community opinion. The rating is based on all available reviews for this product but only English one are displayed in this page. Online order for residents of Canada and United States only.